Several weeks ago a young lady came in for a week of intensive Scoliosis treatment. We were very pleased with her results; see below her posture improvement and the improvement of the spinal curve. 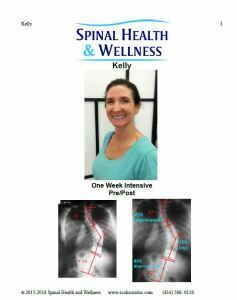 With just a quick look you can tell how her posture has improved and how much smoother her back is after just a week of treatment. 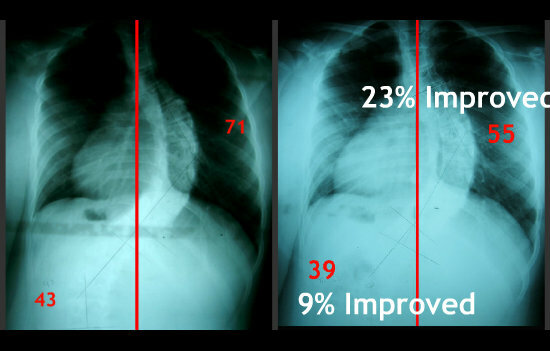 The red numbers on the x-ray are the degree measurements of the curve in her back, which means thta at the end of the week she had 23% improvement in the upper curve of her back and 9% in the lower. We were so pleased with her hard work! We are always so happy to see our patients doing well and we wanted to share this success story! How did you feel before you came to our office? How have you benefited the most from spinal re-modeling treatment in our office? What would you want others to know about our office? How would you recommend or encourage others to gain health at our office? Medical physicians commonly use Botox, a medication intended to treat wrinkles, on patients with headaches. They also give Singular, an adult asthma/allergy drug, to children with atopic dermatitis. This practice is called “off-label prescribing” and it’s so common that the Agency for Healthcare Research & Quality estimated 20% of all prescriptions are written for off-label use. Since this now happens on a daily basis, it doesn’t really shock anyone. Plus, it’s perfectly legal. What you might be surprised to find out, however, is that chiropractic care has off-label uses of its own. If you have generalized back or neck pain, chiropractic adjustments are very helpful. This type of pain relief could be considered an “on-label” reason for seeking the assistance of a chiropractor. But what about the patients who don’t have back or neck pain, and elect to receive chiropractic care for relief from other conditions? Examples may include constipation, dizziness, or TMJ. Believe it or not, chiropractic offices across the world are filled with patients receiving these “off-label” benefits. That’s why you might hear chiropractors discussing how they’ve been able to help patients with psoriasis or IBS. To outsiders, this can seem like complete quackery. And while I would consider it irresponsible for chiropractors to advertise a “cure” for these conditions, I wouldn’t necessarily call it a hoax. Some people with non-musculoskeletal conditions really do respond well to chiropractic care. In fact, just yesterday, two of my patients expressed how they can immediately feel their sinuses open up after getting an upper cervical adjustment. Now, both of them originally came to see me for “on-label” reasons – neck pain and upper back stiffness. I didn’t attempt to diagnose either of them with any sort of sinus issue, nor did I ever tell them that the adjustments would help sinus congestion. Moreover, neither one mentioned sinus irritation being a concern when we first met. But now, they each come back as needed for an “off-label” benefit (improved sinus function), as well as typical relief from back/neck pain. Why does this happen? The answer is fairly simple: Our bodies function better with a strong and balanced spine that moves properly. I invite you to consult with a reputable chiropractor in your area so that you too may experience the “off-label” benefits of chiropractic care. Magnesium, the 5th most abundant mineral in the body is necessary for over 300 chemical reactions for normal bodily functions, such as proper muscle and nerve function. However, this mineral cannot be manufactured by the body. In order to have adequate levels, we need to get it through diet or supplementation. Foods high in magnesium include green vegetables such as spinach, swiss chard, okra, broccoli. It’s also found in nuts and seeds such as almonds, sunflower, sesame seeds, whole and sprouted grains, beans. It can be found in variety fruits such as berries and bananas. Researchers estimate the average adult has about 25 grams of magnesium within the body, and about 60% of that amount is found in the bones, 27% in muscles, 6% in cells, and 1% outside of cells. The recommended daily allowance (RDA) of magnesium for males and females at different stages in their lives varies, from 30 mg for infants up to 6 months of age to 360 mg for adolescent females and pregnant women over age 31. A study in 2003 from the National Health and Nutrition Examination Survey evaluated the amount of magnesium Americans consumed in their diet and found most were consuming 75 – 100 mg less than the RDA for magnesium. 68% of adults consumed less than the RDA of magnesium, 45% consumed only 3/4 of the RDA, and 19% consumed only 1/2 of the RDA. Decreased magnesium consumption in the U.S. may be due to the increase in convenient processed foods which are highly magnesium deficient. During the refinement process, magnesium and other nutrients are lost. Dry roasting of nuts and seeds removes the magnesium-rich oil. Milling flour from grains strips away magnesium. Physical & emotional stress depletes magnesium levels in the body. Low stomach pH prevents proper absorption of minerals in the body. Carbonated beverages (with phosphoric acid) and processed foods with phosphates bind to magnesium in the intestines and prevents its absorption. Refined sugars cause the body to excrete magnesium from the kidneys. Mineral imbalances in the body that inhibit proper magnesium utilization. Excessive use of diuretic products leaches magnesium from the body. Caffeine causes the kidney to release extra magnesium in the urine. Alcohol lower the availability of magnesium to the cells and causes an increase in excretion from kidneys. There are ways to supplement magnesium in the body. The most effective methods are transdermal or internal consumption in liquid form. 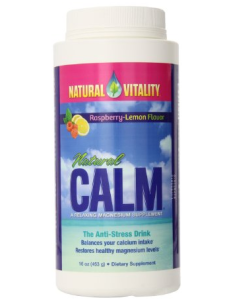 For the liquid absorption, an effective method is through CALM magnesium powder. It’s activated by adding warm water which dissolves the powder into a drinkable form. It is sweetened with stevia, not sugar. And, there are several flavors available through local health food stores or online at Amazon. If you’re not one to ingest liquids, or you don’t prefer the sweet-tart taste, then you might prefer the transdermal approach. Ancient Minerals makes a topical magnesium oil spray and a lotion. The spray should be applied to the thighs or abdomen. However, for many people, it can cause an itching or burning sensation as it’s absorbed which might be uncomfortable. You can counter this sensation by first applying a carrier oil such as olive or coconut oil. The lotion doesn’t have a tingling sensation, but it also doesn’t deliver as much magnesium as the oil. Both products are usually available at most health foods stores as well as Amazon. 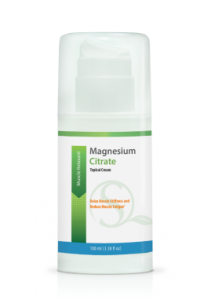 My favorite method of late for getting magnesium in the system in young children and myself is the topical magnesium citrate cream from Scientific Bio-Logics which has a liposome base which is only available through health care practitioners. Great news! We now carry this product at Spinal Health & Wellness. Helps synthesize essential molecules such as nucleic acids. Tightness, stress, and pain at the base of the skull has long been an issue that required hands-on therapy from a chiropractor or massage therapist. The sub-occipital release maneuver performed by these professionals can open up the space between the skull and spine. Patients with this type of pain pattern would ask, “Is there anything I can do for this at home?” And while there are a couple of stretches and make-shift remedies that I could recommend to temporarily reduce discomfort, they aren’t nearly as effective as the manual pressure release performed in-office. I tried it two different ways. The picture above is how I’d suggest you use it as well – it feels more natural, comfortable, and relaxing when the head is cradled in this manner… but it can also be turned the opposite direction, with the sloping side beneath the neck instead. This approach, however, is a more advanced/progressive position, so it may create some discomfort for first-time users. I tried it on a variety of surfaces, from firm and soft mattresses (including memory foam), to carpeted floors and on hardwood. I also used it lying flat on my back, as well as with my legs raised in the static back position. I experimented with different durations of time, and times of day, to see if there was a difference in the outcome. Lying flat is recommended, but combining it with the static back position provided a slightly deeper impact on the tissues that some may find beneficial. The preferred time of day was in the evening, immediately before going to bed. There’s nothing wrong with using this earlier in the day, but the relaxation I attained at night before going to sleep was noteworthy. The reason this happens is likely due to the deep tissue-penetrating effects in this specific region of the spine. It stimulates the parasympathetic nervous system which has a calming effect on the body. 5-minutes was all it took to notice a change, but I set my timer for 7-10 minutes each night, and that became my preference. Once I was finished, I rested with my head flat on the floor for an additional minute or two. Each time I did this something interesting happened within 15-20 seconds… a distinctly warm/hot sensation permeated my upper neck. This rapid increase of blood infusing the soft tissues beneath the skull was almost addictive. I found myself looking forward to the sensation each time. I also noticed that my sleep quality, which was already pretty good, was even better on the nights that I used the CranioCradle before bed. There are similar products on the market, but they vary in price and functionality. The Upledger Institute International has their own version of this called the Still Point Inducer. While listed at half the price, it’s less specific to the sub-occipital space. It can help ease muscle tension and is noticeably firmer, but doesn’t quite have the same effect on the sub-occipital region of the spine as the CranioCradle. The Cranial Therapy Centre in Toronto created BeCalm Balls. These are squishy, adjustable, and can be widened/separated along a cord. What I like the most about these is that there’s no operator error… Since they’re so soft, you don’t have to worry about placing them in the wrong spot. I also recommend these if you have a high-backed chair. You can place them behind your head at work, lean back, and it will passively (as well as inconspicuously) reduce tension in the upper neck without having to lie on the floor. If you suffer from occipital headaches, or you experience tightness, pain, and discomfort in the back of the head or mid-to-upper neck, I recommend using a CranioCradle. If you’d like to relax at work or during a long trip (flight or car ride), I recommend the BeCalm Balls. Yoga Pose Helps Reduce Scoliosis! There was a new study conducted recently that stated that doing the side plant yoga pose could reduce scoliosis! In the rib cage, the area of greatest curvature is the side that’s facing down or toward the floor in this side plank position. Recommendations are to hold side plank at least 10 – 20 seconds once daily, minimum of 4 days per week for best results. You can check out the Wall Street Journal article here! And the original study here! The time for voting has come around again! CharlottesvilleFamily is hosting their annual Family Favorites Contest, it is a quick and easy survey about favorite places to eat, play, explore and shop along with favorite medical and home services. We’d be honored if you voted for us as your favorite chiropractor! Click here to complete the CharlottesvilleFamily Favorites Survey. You can fill in our name in the health care section (6) under chiropractic services (question 2). A study published in the International Journal of Epidemiology in August 2013 shows a correlation of acetominophen use in pregnancy and later onset of Autism. For women who took Tylenol for at least 28 days total during pregnancy, their children seemed to have poorer motor skills than kids whose mothers had taken the drug fewer times or not at all. Tylenol-exposed kids also tended to start walking later, have poorer communication and language skills and more behavior problems. Long-term use of (acetaminophen) increased the risk of behavior problems by 70 percent at age three. Read the article summary on Yahoo! News or the abstract/full article of the study in IJE. Another study published in JAMA noted that pregnant mothers who use Tylenol or acetominophen have a 37% greater risk for their children developing an hyperkinetic or autism-spectrum disorder. “When women reported having used acetaminophen for 20 or more weeks during pregnancy, the risk for HKD diagnosis in children almost doubled,” the authors write. 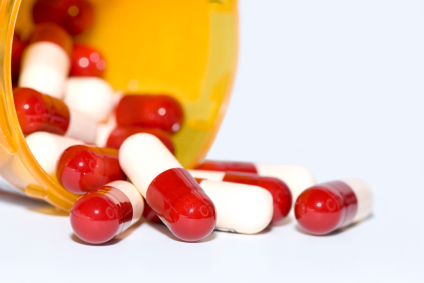 The likelihood of the children being prescribed an ADHD medication rose by 50%. Read the article summary on Forbes, or the abstract in JAMA Peds published in April 2014.